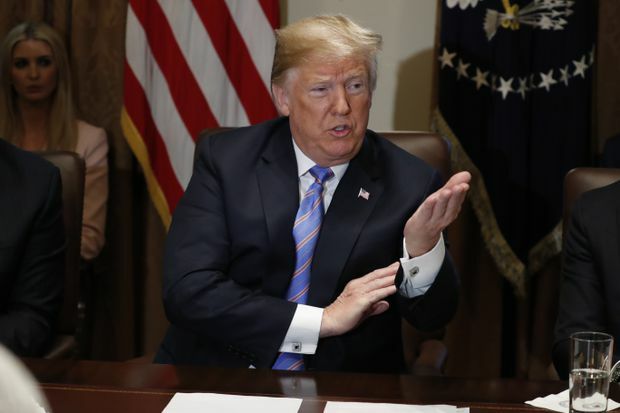 U.S. President Donald Trump speaks during a cabinet meeting in the White House in Washington on Wednesday, July 18, 2018. The White House is leaving open the possibility that President Donald Trump will hand over 10 U.S. citizens – including a former ambassador to Russia – to the Kremlin to face criminal charges as part of Vladimir Putin’s attempts to take down an anti-corruption campaigner. Such a move, according to politicians on both sides of the aisle, would be extraordinary: The United States turning its own officials over to the autocratic leader of a rival country who wants to put them in prison. The assertion by the U.S. President’s spokeswoman came as the Trump administration continued to struggle to contain the fallout from the Helsinki summit, where he embraced the Russian President, refusing to condemn him for allegedly interfering in the U.S. election and seeming to believe Mr. Putin’s denials that he did anything wrong. At one point on Wednesday, the U.S. President appeared to deny Russia was still targeting the United States’ electoral system – contradicting his own intelligence officials – before the White House said he had simply been misunderstood. And the night before, he seemed to muse in an interview that it might not be a good idea for the United States to adhere to its North Atlantic Treaty Organization obligations to defend any ally that was attacked. 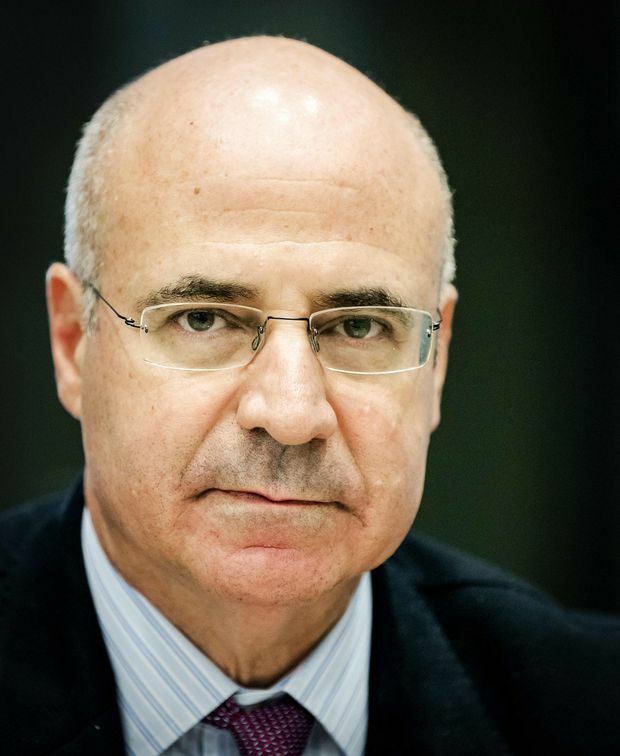 CEO of Hermitage Capital Management Bill Browder, a former Moscow financier turned anti-Kremlin activist. Russia’s demand is related to Mr. Putin’s long-running fight with Bill Browder, a financier who has successfully lobbied the United States and other countries to impose sanctions on Russian officials as punishment for corruption and human-rights abuses. The Kremlin wants to charge 10 Americans, including former ambassador Michael McFaul, as part of what Russia says was plot orchestrated by Mr. Browder to embarrass the Kremlin. Russia has also demanded the handover of two British nationals: Mr. Browder himself, and former spy Christopher Steele. Sarah Huckabee Sanders, Mr. Trump’s spokeswoman, confirmed at a media briefing Wednesday that Mr. Putin had raised his request directly with the President during their summit on Monday. She said Mr. Trump was thinking it over. Within an hour, the State Department put out a different message. “The overall assertions that have come out of the Russian government are absolutely absurd. The fact that they want to question … American citizens,” spokeswoman Heather Nauert told reporters. Whether Ms. Huckabee Sanders was seriously suggesting the American citizens were in danger of being given to Russia, or whether she was caught off-guard by the question and trying to deflect it was not immediately clear. But she drew fire for not delivering a more standard answer – that the United States does not help autocratic regimes prosecute its citizens. Adam Schiff, a Democratic member of Congress, said the very idea had to be dismissed out of hand. “No ‘consultation’ is needed to make clear that U.S. will never cooperate in Putin’s crusade against Bill Browder or former U.S. officials, like Ambassador McFaul,” he tweeted. Ms. Huckabee Sanders did, however, try to tamp down another Russia-related conflagration: Earlier on Wednesday, ahead of a cabinet meeting, after a reporter asked Mr. Trump whether Russia was still targeting the United States, Mr. Trump said “no.” The assertion ran counter to the comments of Mr. Trump’s director of national intelligence, Daniel Coats, who said last week that “the warning lights are blinking red” as Russia goes after the U.S. government and business. Ms. Huckabee Sanders said Mr. Trump had not been answering the question, but had been saying “no” to speaking with reporters. Mr. McFaul said he was “just shocked” that the White House seemed to be considering Mr. Putin’s proposed swap. “I’m deeply disgusted. I don’t understand why the continuing to assign moral equivalency between a genuine indictment of Russian intelligence officers, and a cockamamie, crazy, false, scheme that implicates me and several other U.S. government officials in something that didn’t happen,” he said in an interview. Mr. McFaul was the U.S. ambassador to Moscow during a series of protests in 2012 that briefly threatened Mr. Putin’s grip on power. Mr. Putin personally blamed Mr. McFaul and then-U.S. secretary of state Hillary Clinton for instigating the uprising. In another controversial assertion, Mr. Trump mused in a Fox News interview aired late Tuesday that Montenegro – a country of 640,000 people – was “very aggressive” and could start World War Three. In such a case, he suggested, the United States may be better off not getting involved, even though Montenegro is a member of NATO that has fought to free itself from Russian influence. By Wednesday evening, Mr. Trump was insisting that, contrary to his public comments with Mr. Putin, he had actually told the Russian President privately to stop meddling in U.S. elections.